A new programme was launched on the 22nd May enabling Sentinel-1 and Sentinel-2 data to be used to support the monitoring of the European Union’s Common Agricultural Policy (CAP). to ensure supplies reach consumers at reasonable prices. CAP itself was set-up in 1962 with six agricultural products – cereals, pig meat, eggs, poultry meat, fruit and vegetables and wine. Today, agri-food is one of the largest economic sectors within the EU, accounting for 44 million jobs and exports worth €130 billion per year. CAP has evolved and now has more focus on sustainability, environmental protection, biodiversity and protecting the climate. The food mountains of the 1970’s. Subsidy incentives encouraged use of fertilizers and pesticides. Suggestions that some EU countries benefit more than others – this has long been a complaint of UK farmers. Cost – currently the CAP budget is €59 billion per year. Bureaucratic overhead of the monitoring and inspection routine. 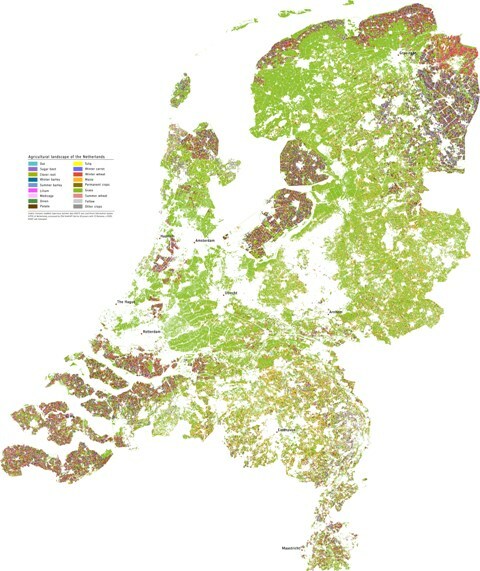 Given the increasing use of Earth observation data in agriculture, it is not surprising that attempts have been made to use Copernicus data within the CAP framework. It began with the Sentinels for Common Agricultural Policy (Sen4CAP) project which looked at how the data from Sentinel-1 and Sentinel-2 could be used as part of the evidence and inspection regime for the CAP programme. Cultivated crop type map: to identify what crops are being grown, which is important for the crop diversification part of CAP. Grassland mowing product: to detect the mowing events at parcel-level. It’s also useful for crop diversification monitoring and the identification of permanent grasslands. Vegetation status indicator: to give information about the vegetation status and its growing condition. Agricultural practices monitoring product: aims to identify the agricultural practices of crop harvesting and ploughing of grasslands, and compares farmer declarations of fallow lands, or the growing of catch-crops/nitrogen-fixing crops, against remote sensing data. In addition, the data from these will be analysed with machine-learning algorithms to provide crop maps and support cross-checking the EO data with the relevant declarations. Last week it was agreed the six pilot countries, Czech Republic, Italy, Lithuania, Netherlands, Romania, Spain, would be using the Sentinel data to replace some of the paperwork and physical visits previously needed to ensure that farmers were eligible for subsidy payments. It is good to see remote sensing data been further recognised as evidential baselines for Government organisation, which it is hoped can be expanded into other areas in the future. This entry was posted in Agriculture, Copernicus, Data, Earth Observation, Policy, Remote Sensing, Satellite, Sentinel, Space Can Help, Space Industry, visualisation and tagged agri-food, agri-tech, agriculture, CAP, Common Agricultural Policy, Copernicus, Earth Observation, EO, EU, European Union, Satellites, Sen4CAP, Sentinel-1, Sentinel-2, Sentinels for Common Agricultural Policy, Space, Treaty of Rome by Andy. Bookmark the permalink.